From Bryce Coward, CFA: Emerging market stocks have taken it on the chin so far in 2018, down 9% and unperperforming the MSCI World Index by about 8%. There are of course plenty of excuses for such bad performance, from trade related issues to the breakdown of the synchronized global growth story. Even still, plenty of market-based indicators suggest the damage done to EM stocks has been a bit overdone. Below we briefly hit on five of them. First, oil is basically at its high of the year. Oil and emerging market relative equity performance is highly related. Oil is of course one barometer of global liquidity conditions, just like EM stocks. Oil is also a good barometer of global growth. Besides that, many EM countries export oil, meaning that when oil prices rise, those countries make more money. 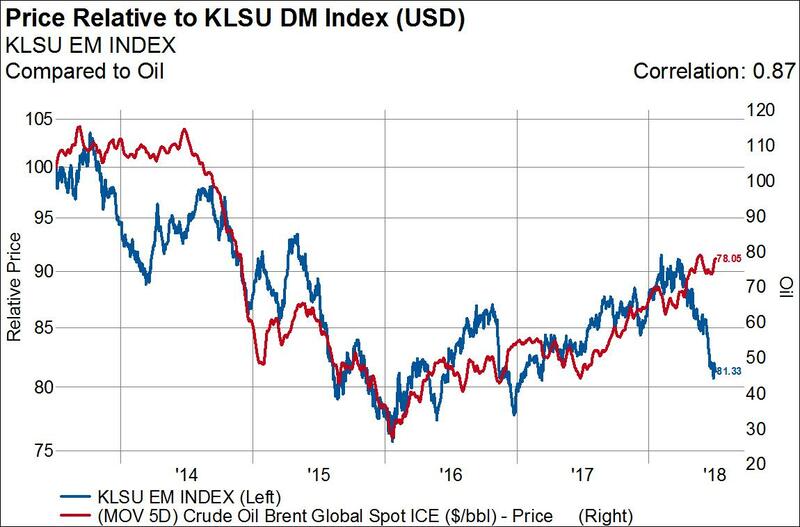 That is why oil prices and EM stocks almost always move with each other. Second, global shipping rates are just about at cycle highs, which is inconsistent with new lows in EM equity relative performance. 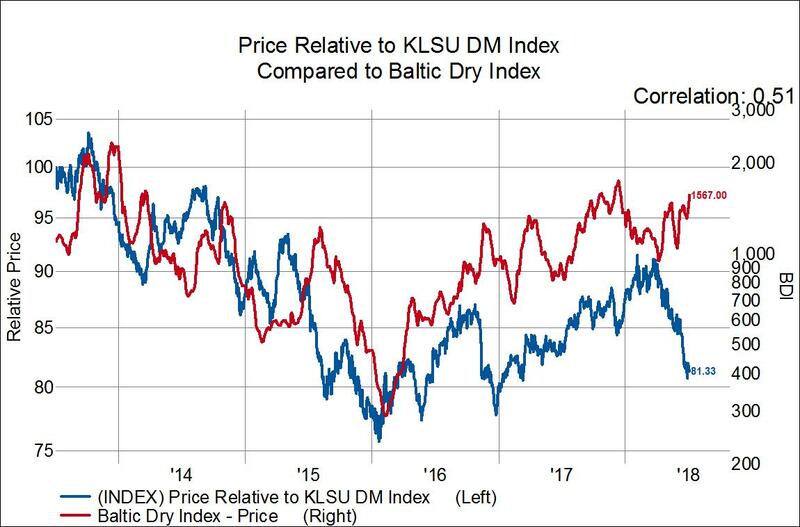 Traditionally, the Baltic Dry Index and EM relative performance go hand in hand, even if the correlation isn’t perfect, because shipping rates are an indicator of both growth and liquidity, just like EM stocks. Third, financial conditions are improving. 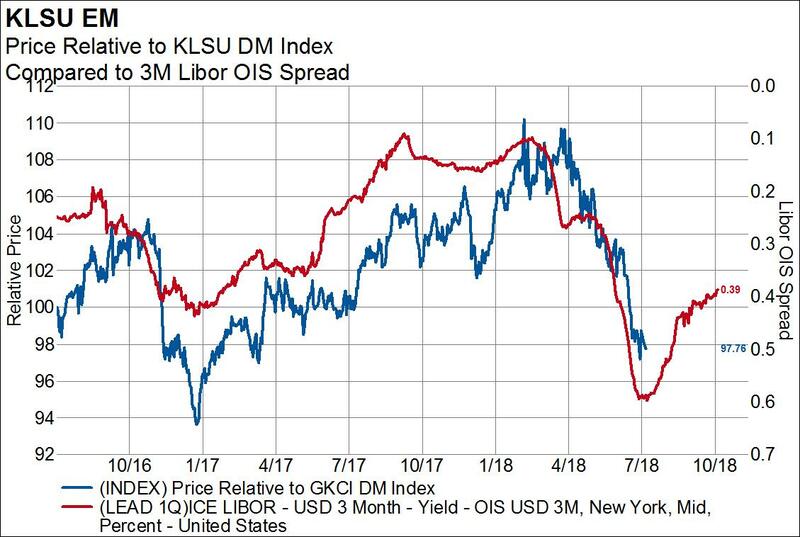 One blunt tool of financial conditions is the difference between libor and the overnight index swap, called the libor-OIS spread. Overnight index swaps are analogous to secured lending, whereas libor is analogous to unsecured lending. Therefore, the difference between these two rates is a measure of stress in the financial system. The libor-OIS swap tends to lead the relative performance of EM stocks by about three months, so the narrowing of the spread which began three months ago suggests possible upside for EM stocks from here. 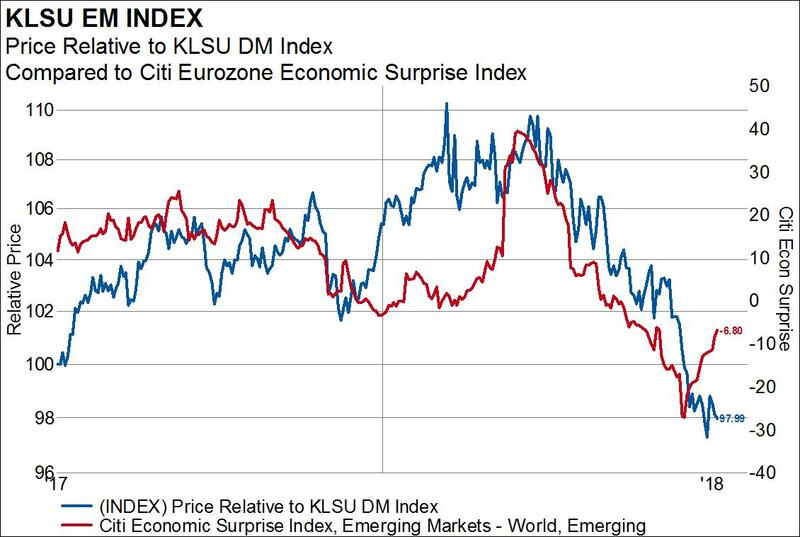 Fourth, the Citi Economic Surprise Index for emerging markets seems to have bottomed. It appears as though the bar for emerging market economic data has been lowered to the point where we are seeing fewer and fewer negative surprises. This is typically consistent with a bottoming process in EM stocks. Last, but not least, EM stocks are oversold. 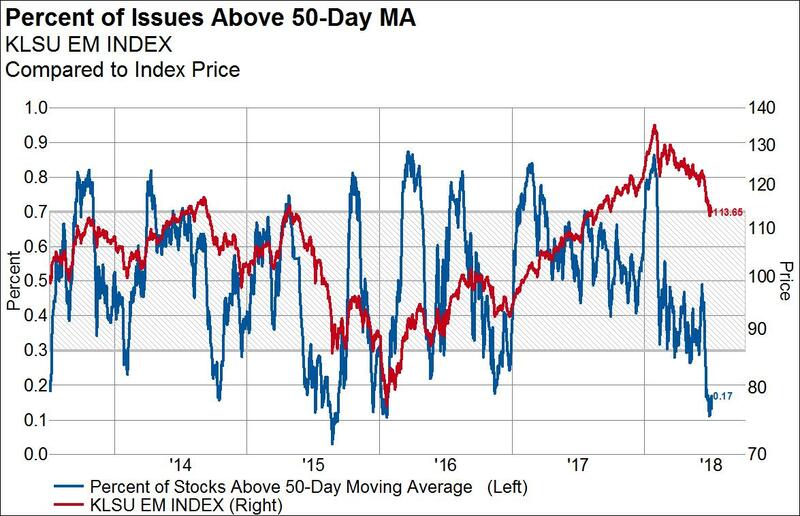 Based on the blunt indicator of the percent of stocks trading above their own 50-day moving average, EM stocks are about as oversold as they were back in their bear market of 2015 and 2016. The iShares MSCI Emerging Markets Indx ETF (EEM) rose $0.02 (+0.05%) in premarket trading Friday. Year-to-date, EEM has declined -9.13%, versus a 2.75% rise in the benchmark S&P 500 index during the same period.